Following the early Haiti auction in Spain in January, April sees a superb selection of Ecuador classics up for auction at the annual Westpex show in San Francisco. Long-term incumbent auctioneers at Westpex, Schuyler Rumsey, are presenting a very focused collection of some of the key pieces of Ecuadorian philately. The sale takes place on April 27th. 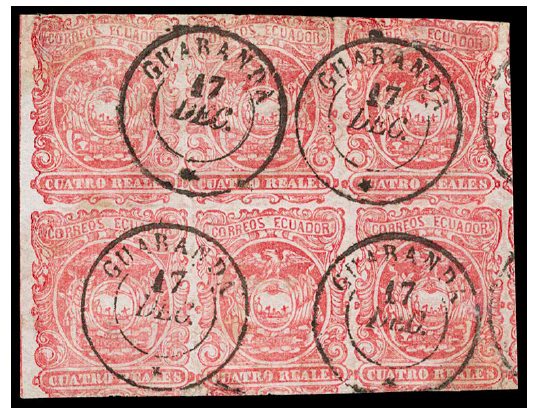 The auction is concentrated on the first seven stamps of Ecuador issued between 1865 and 1872, with a strong focus on postal history, blocks, panes and rare usages. Many have strong provenance and have graced previous award-winning collections of Ecuador. Needless to say, this will be an essential auction for any serious collector of Ecuador and an infrequent opportunity to select from some of the country’s key rarities. The catalogue will prove to be a useful reference document and can be accessed via the Schuyler Rumsey website or downloaded here Ecuador 1865-72, 1-8 S.Rumsey Sale.